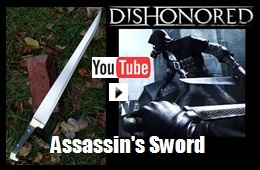 The Assassin’s Sword – Influenced From the Game Dishonored. See Pictures, Prices, and Descriptions. Made by Scorpion Swords & Knives. Leather color used will be brown or black, depending on what is available. This sword is influenced from the Game Dishonored. Daud, a leader of a group of assassins called the Whalers, that operate in Dunwall, uses this sword. Daud became infamous as an assassin, feared not only for his skill, but also for his magic powers.